Historically, the users of infrastructure assets have not been a priority consideration for many operators. Infrastructure facilities tend to enjoy a natural monopoly, so there is little competitive pressure to provide outstanding customer service. Instead, a “public service mentality” tends to prevail – the dutiful provision of predefined, uniform service for customers rather than an engaged effort to monitor their changing needs and satisfy their wishes. The customers, on their side, might grumble, but their options are limited, especially if the service is subsidized or provided for free, and usually no alternative provision exists anyway. On the users’ side, expectations are rising not only because of the increasingly applied “user pays” principle, and increased competition and privatization, but also because customers increasingly compare their local service to international benchmarks, such as the Skytrax rating of airports.76 As some user groups consolidate – through airline and shipping mergers or alliances, for example – so their clout increases. Against this background, infrastructure operators need to take steps to advance their service levels. Three broad strategies are indicated: adopting a customer-centric operating model; enhancing the end-to-end user experience; and launching smart technologies to refine performance. Infrastructure has traditionally been an engineering-driven endeavour, which puts greater emphasis on the asset than on the user. By custom, the operators adhere to predefined performance standards derived from stable, well-defined and standardized regulatory requirements and/or technical handbooks, and pay little attention to customers’ ambiguous and diverse needs. The providers might put great effort into optimizing the asset’s technical features (e.g. the speed of trains), while disregarding what is really important to the customer (e.g. access to and frequency of the trains, and the comfort and general experience of the journey). In view of these challenges, however, some operators are beginning to see the virtues of a more customer-centric mindset, and are trying out the standard marketing tools routinely applied in consumer industries. To embrace customer orientation, they should seek to improve customer insight, and then adopt an operating model that enables continuous client focus and service. Identify the customers and segment the customer base. Infrastructure operators do not necessarily have a direct relationship with end users, and so might not have a good understanding of their needs. Both direct and indirect customers exist: at airports, the airline companies as well as passengers; and at ports, the shipping lines, third-party logistics providers, railways and trucking companies, all with their distinct needs. Some airports have duly developed an in-depth understanding of their various customer segments, even targeting non-travellers (e.g. sightseers and pick-up people), and increased their appeal to them through, for example, airport events, visitor tours and improved landside shopping outlets. Understand what the customers need. Conducting market analysis and research to provide a thorough understanding of the drivers, trends and economics of the corporate customer’s business and the end user’s personal needs can help create a compelling customer experience for infrastructure assets and related services. Conduct customer surveys: While standard procedure in consumer industries, surveys are still underutilized by infrastructure providers. 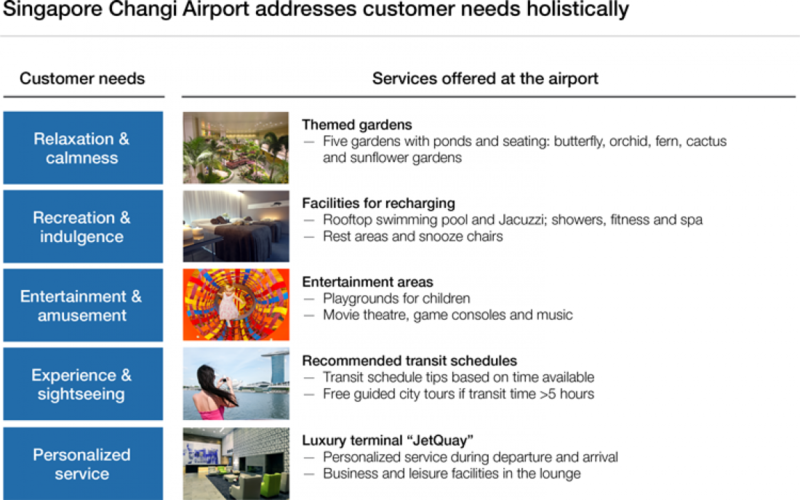 A survey of 10,000 airport users on their most-wanted amenities revealed that 49% want a cinema, 36% would appreciate sleeping options and, perhaps surprisingly in the age of e-readers and smartphones, about 32% would like a library; yet, only a few airports offer these services.77 Without proper market research, operators often give priority to “hard” characteristics such as speed, rather than to “soft” characteristics (e.g. convenience, reliability), even though users might also demand the latter. 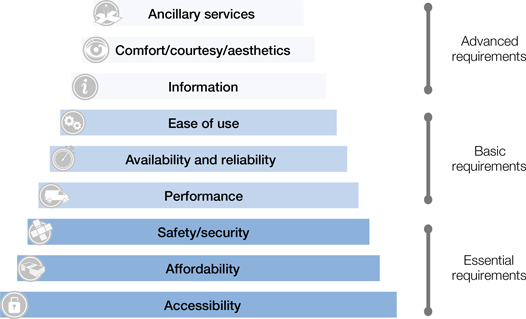 Assess user needs according to various categories: These cover essential requirements such as accessibility, affordability and safety; basic requirements including performance, reliability and ease of use; and advanced requirements such as information, comfort and ancillary services (Figure 14). While the basic requirements are “hygiene factors”, the higher-level requirements can provide a differentiated user experience. Establish what the customer values in order to prioritize spending among the quality categories. Use advanced analytical tools including conjoint or discrete choice analysis, based on revealed or stated preferences data or big data analytics, to clarify customers’ willingness to pay. Also, consider upgrading to two-way user engagement through social networks to receive lively feedback. The overall objective is not to maximize quality, but to deliver the appropriate level of quality in line with the users’ quality-cost trade-off. In other words, operators need to strike a trade-off between service improvements and increased costs. Such an approach will help to accomplish two aims: first, to challenge over-engineered technical specifications with no tangible benefit to the end user; and second, to ensure that hidden customer requirements do get fulfilled. Enable and institute customer orientation in the operating model. Define a customer value proposition, differentiated by customer group. For example, some ports are specializing in a particular user segment, such as shippers seeking to minimize port and service fees, or shippers whose priorities are quick turnaround times and streamlined procedures. In fact, a single infrastructure facility can provide for more than one customer segment. Kuala Lumpur International Airport in Malaysia opened a special terminal to serve low-cost airlines that value quick aircraft turnarounds and low airport fees, while the main terminal caters to full-service carriers by providing short connecting times and high-quality services. Evaluate the competitive advantage and the uniqueness of the value proposition relative to competition (which is often indirect). For example, the Panama Canal monitors the alternative routes, such as the US intermodal land bridge or the Suez Canal, segmented by type of goods. Develop and implement a comprehensive marketing plan. The benefits can be remarkable: even toll roads, where demand is largely exogenous, have increased revenues by about 10% using the full marketing mix – product and process improvements such as e-tolling, special promotions, price optimization by time and user group, and loyalty programmes. Measure and track customer performance and satisfaction. Set up an outcome-oriented internal management system based on key performance indicators (KPIs) with specific quality targets. Incentivize the organization through performance standards and service-level agreements (for example, some airports have entered into KPI-based quality-performance agreements with airlines). In addition, communicate the quality results to stakeholders to keep them informed. However, care should be taken to manage expectations; for instance, rail customers might expect 100% punctuality, but for most operators a realistic target is about 80%, and they should engage customers accordingly. Shift to a customer-oriented organizational set-up. Leighton Contractors in Australia uses a 24 hours a day, 7 days a week (24/7) help desk at the South East Queensland Schools PPP to serve as a single point of contact for teachers to discuss any concerns about security, cleaning, maintenance, groundkeeping and janitorial services. The helpdesk resolves 97% of issues at first contact, thereby freeing teachers to devote their energies to educational outcomes. And the Dutch oil and gas terminal company Royal Vopak uses a key account management system as a one-stop shop for customers, contributing to its consistently high occupancy rate. Engage the workforce. To ensure high-quality customer service, a committed workforce is just as important as well-defined processes and advanced technology. The high punctuality levels on Japanese railways, for example, are attributable not only to excellent maintenance, availability of reserve carriages and careful timetable planning, but also to the training of new drivers on punctuality, and to the governance model that enables communication and coordination across drivers, and allows departments to excel in incident management. The best operators not only address the basic requirements of users, but also strive to create a positive end-to-end user experience in two respects: the operators excel in ancillary services by holistically addressing all customer needs (Figure 14), and they optimize the whole network performance by partnering with adjacent assets and other stakeholders. Sources: Changi Airport, http://www.changiairport.com/our-business/about-changi-airport; Service Innovation by a World-Class Airport: The Case of Singapore’s Changi Airport, September 2008. Singapore: EGL Singapore. Optimize the quality of the full system, in partnership with other stakeholders. Infrastructure assets operate in networks, and an individual operator is unlikely to have full control over the whole system’s performance. No matter how impressively any one operator performs, the user experience could be dented by any poor performance on the part of adjacent assets or carriers using the infrastructure. Accordingly, to optimize full system performance and the end-to-end customer experience, partnering is crucial. Partner with main users. Enter into strategic partnerships with the main clients, as they play a key role in delivering quality to the end user. Frankfurt Airport cooperates closely with its main airline by integrating information, logistics processes and IT systems, to keep connecting times to a minimum and avoid delays and lost baggage. Partner with adjacent assets. Port operators, for instance, need to cooperate with adjacent supply chain operators (e.g. railways) to optimize hinterland connectivity and intermodal processes, and thereby enhance the full supply chain’s competitiveness. Consider the example of e-tolling on highways and its effects: for customers, it speeds up the journey and reduces congestion; for the operator, it reduces the cost of collecting payments; and for the environment, it lowers emissions and fuel consumption by reducing stops and waits at tollbooths. Smart technologies can be employed to produce three types of improvement in quality for users: better customer information and interaction; improved system performance and safety; and faster billing and payment. Operators need to take advantage of using smart technologies in each case. Increase and refine customer information and interaction. Many municipal transport agencies have established portals or apps with maps, real-time traffic information and intermodal journey planners. For example, the Singapore Land Transport Authority developed “MyTransport.SG”, a one-stop app for travellers to plan a seamless trip, and to get real-time information on parking availability, train delays and road congestion. When Ottawa, Canada introduced a real-time passenger information system, bus ridership rose as commuters no longer had the traditional disincentive of unpredictable waiting times. Improve system performance and safety for customers. Provide fast and reliable billing and payment services to customers. In the US, the Oklahoma Turnpike’s e-toll system Pikepass has benefited commuters in two ways: journeys are smoother and quicker, and paying by e-toll costs 5% less than paying by cash. For the operator, it has reduced transaction costs by more than half, resulting in first-year savings of US$ 2 million. Such smart systems can generate further value for operators; by collecting and analysing data, they can gain deeper insight into user behaviour and thereby optimize capacities, enable time-based pricing and provide additional information to customers. Smart solutions are not a panacea, of course, and sometimes they are inappropriate. They can be difficult to integrate into legacy systems, and the investment required for acquiring and installing them might not be worth it. Some smart meter projects, for instance, have failed to provide a positive business case. 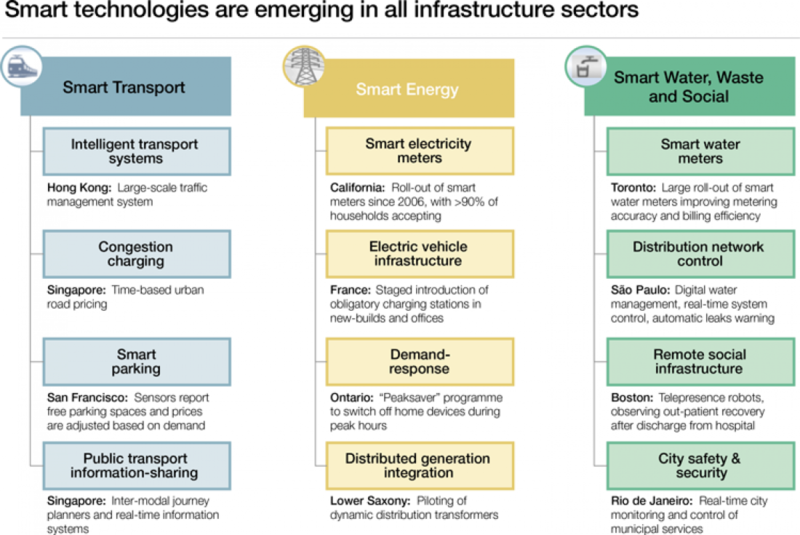 Moreover, the technology landscape is still evolving, with asset-heavy solutions implemented by infrastructure operators competing against asset-light and smart-phone-based solutions. Despite this uncertainty, many technologies that appear too expensive today will increasingly become cost-effective when implemented at scale, and will further enhance the effectiveness and efficiency of infrastructure assets. 75 The Smart Grid. An introduction. U.S. Department of Energy, Litos Strategic Communication. 76 “World Airport Rating”. Skytrax, http://www.airlinequality.com/AirportRanking/ranking-intro.htm. 77 “International survey reveals travellers’ dream airport”. Skyscanner, http://www.skyscanner.net/news/international-survey-reveals-travellers-dream-airport, 2013. 78 “Aéroports de Paris pursues the perfect passenger experience”. Airport business, www.airport-business.com/2013/04/aeroports-de-paris-pursues-the-perfect-passenger-experience/, April, 2013. 79 “Panama Canal Authority launches just-in-time-service”. Port Technology International, http://www.porttechnology.org/industry_sectors/panama_canal_authority_launches_just_in_time_service, 2013. 80 “Etapes estivales: vous donner envie de vous arrêter!”. Vinci autoroutes, http://www.vinci-autoroutes.com/fr/article/etapes-estivales-vous-donner-envie-de-vous-arreter, 2012. 81 “ADPC and ADT sign MoU with Government agencies to speed up port transactions”. ADPC, http://www.adpc.ae/en/news/media-centre/press-releases/news-113.html, 2013. 82 Best Practice in Infrastructure Asset Management. Creating and maintaining value for all stakeholders. December, 2010. London: First State Investments. 83 “NYC DOT Announces Expansion of Midtown Congestion Management System, Receives National Transportation Award”. New York City Department of Transportation, www.nyc.gov/html/dot/html/pr2012/pr12_25.shtml, 2012. 84 Inter-American Competitiveness Network. Signs of Competitiveness in the Americas Report 2013. 85 Safety Tutor Project. Autostrade per l’Italia Spa. http://www.asecap.com/english/documents/GalataASPI_000.pdf. 86 “Evaluation of residential smart meter policies. WEC-ADEME Case studies on Energy Efficiency Measures and Policies”. VaasaETT Global Energy Think Tank. July 2010. 87 McLysaght, Gao and Chen. “The Hong Kong Octopus Card”. http://chenx.richie.idc.ul.ie/Chinese%20pages/thesis/OCTOPUS.pdf.